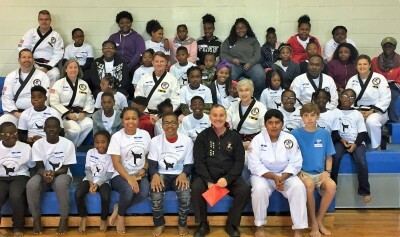 The Atlantic Pacific Tang Soo Do Foundation held its first ever Leadership Event in Camden, Alabama on Saturday, Nov. 10 at the Camden School of Arts & Technology. The event was coordinated by the Foundation and the Edmundite Missions. Grandmaster John St. James traveled from Atlanta, Georgia to greet the participants. Additionally, traveling was the team of Masters: SBN David Watson-Jones, SBN Allister Akong, and SBN Laura Lee Sandberg with Mrs. Jean Ann and Samantha Watson-Jones and Jesus Ramos from Atlanta. From Florida were Bu Sabom Brad and Jennifer Walston and 2nd degree David Walston. Master SBN Chris Watson came from Wetumpka, Alabama. Master Sister Kathy Navarra is the local instructor. The event drew 38 children aged between 7 and 16 from Selma, Vrendenberg and the local Camden area. The program focused on using communication, goal setting, teamwork, courage and perseverance to help attendees reach their goals. Grandmaster St. James began the program with stories of goal setting. “Goals we set are goals we get.” He taught STAR “Success Through Accepting Responsibility”, and DIA: “Decide In Advance”. The morning included sharing goals and finding ways to meet and greet strangers. Each discussion was followed by games to reinforce the topic; relay races, balancing challenges and teamwork activities to demonstrate “Together Everyone Achieves More”. All participants received notebooks, t-shirts and posters as a reminder of the lessons learned. The Edmundite Missions provided 60 lunches to all participants. A big thanks goes to our local support staff that included Michelle Hasselvander, Mr. and Mrs. Prince Arnold, Ethel Salter, Monica Williams, Winston Williams, Bruce Brown and Ta’Ronce Roland. Special thanks to Dr. Saulsberry for the use of Camden School of Arts & Technology. The Atlantic Pacific Tang Soo Do Foundation is a 501c3 organization providing education, awareness and funding related to the martial arts of Tang Soo Do. Services are designed specifically for at-risk youth, teens, individuals with special needs and the elderly. Sister Kathy Navarra teaches under the auspices of the Foundation in Vredenburgh, Vtown Family Karate and in Camden at the Community Center. To end on a personal note, as a Sister of St. Joseph I have the privilege of working with both the Edmundite Missions and the APTSD Foundation. People who walk their talk. People who live the Moodo Spirit of putting forth their time, talent and energy to help others toward a better way of life. These people are genuinely good and generous. In the midst of our poverty, divisions and injustices, these groups bring hope and joy into my life and all those they touch. I can not thank them enough for coming to Camden, Alabama and sharing with our children. Blessings and Tang Soo!